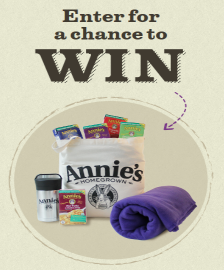 Annie’s Soups Sweepstakes – Win a soup comfort kit! Win a soup comfort kit (10 winners)! ENTER SWEEPSTAKES HERE – Annie’s Sweepstakes page. ENTRY LIMIT – Limit one (1) entry per person and per email address throughout the Sweepstakes Period. 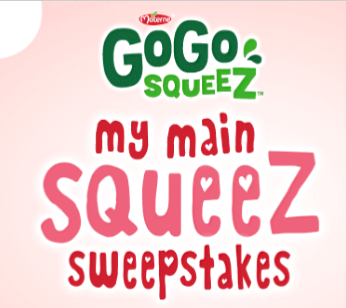 SWEEPSTAKES ENTRY PERIOD – Annie’s Soup Sweepstakes, from 12:00 A.M Pacific Standard Time (“PST”) on September 16, 2015 to 11:59 P.M. PST on November 28, 2015. PRIZES – Ten (10) Grand Prizes: each Grand Prize is a soup comfort kit, including a thermos, five (5) cartons of Annie’s soup (assorted flavors), an eco-friendly blanket, and a tote bag. Approximate Retail Value (“ARV”) of each Grand Prize is $80.00. One Thousand (1000) First Prizes: each First Prize is a coupon redeemable for one (1) carton of Annie’s soup (coupon value up to $3.99). Approximate Retail Value (“ARV”) of each First Prize is $3.99. 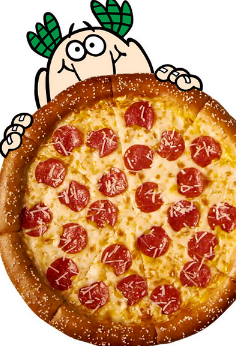 Little Caesar’s Join the Pretzel Crust Nation Sweepstakes – Win a GoPro camera! ENTER SWEEPSTAKES HERE – Little Caesar’s Sweepstakes page. ELIGIBILITY – Join the Pretzel Crust Nation (the “Sweepstakes”) is open only to legal residents of the fifty (50) United States and the District of Columbia who are at least eighteen (18) years old at the time of entry. SWEEPSTAKES PERIOD – The Sweepstakes begins on July 8, 2015 at 12:00:00 a.m. Eastern Time (“ET”) and ends on August 31, 2015 at 11:59:59 p.m. ET. PRIZES – ONE (1) GRAND PRIZE: A GoPro camera. Approximate Retail Value (“ARV”): $200. FIVE (5) FIRST PRIZES: A $30 Little Caesars gift card. ARV: $30. TEN (10) SECOND PRIZES: A $20 Little Caesars gift card. ARV: $20. FIFTEEN (15) THIRD PRIZES: A $10 Little Caesars gift card. ARV: $10. Birch Lane Backyard Entertaining Essentials Sweepstakes – Win a $1,500 Birch Lane gift card & more! Win a $1,500 Birch Lane gift card, a $200 Stonewall Kitchen gift card & more! ENTER SWEEPSTAKES HERE – Birch Lane Sweepstakes page. ENTRY LIMIT – Limit of one (1) entry per person, per email address during the Promotion Period. ELIGIBILITY – The Promotion is open only to legal residents of the United States and the District of Columbia (excluding residents Rhode Island and Guam, Puerto Rico and all other U.S. territories and possessions), who are 18 years of age or older at the time of Promotion registration. 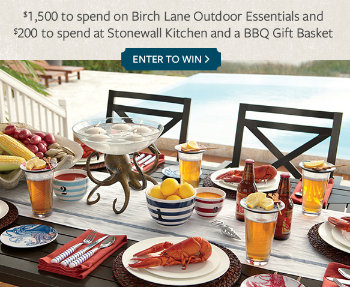 SWEEPSTAKES PERIOD – Birch Lane Backyard Entertaining Essentials (“Promotion”) begins at 6:00 am on June 8, 2015 and ends at 11:59 pm June 22, 2015. -$1,500 gift card to Birch Lane. -A $200 Stonewall Kitchen gift card, and a Stonewall Kitchen BBQ essentials gift basket worth $155.10, consisting of Maple Chipotle Grille Sce 11oz; Curried Mango Grille Sce 11oz; Mesquite Steak Sauce 11oz; Bourbon Molasses BBQ Sce 11oz; Boozy Bacon Barbecue Sauce11oz; Pulled Pork & Shredder Kit; Carolina’s Rub; Cornbread Mix; Autographed SWK Grilling; Country Ketchup 16 oz; Memphis Rib Rub; Texas Rub; Espresso Rub; Chicken & Pork Spice Rub; Farmhouse Green Relish 17.5 oz; Farmhouse Red Relish 16 oz. King’s Hawaiian Sweetest Summer Ever Instant-Win Game – Win 140,000 Hawaiian Airline Miles & more! Win 140,000 Hawaiian Airline miles & more! ENTRY LIMIT – Limit: Each participant may play the Instant-Win Game one time per day during the Promotion Period. 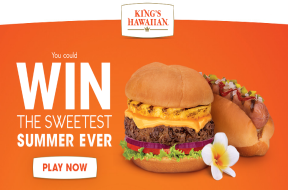 ELIGIBILITY – The King’s Hawaiian® Sweetest Summer Ever Instant-Win Game is open to legal residents of the 50 United States or the District of Columbia who are 18 years of age or older at time of entry. SWEEPSTAKES PERIOD – The King’s Hawaiian® Sweetest Summer Ever Instant-Win Game begins at 12:00:01 AM Eastern Time (“ET”) on Monday, May 18, 2015 and ends at 11:59:59 PM ET on Saturday, July 4, 2015. F) One (1) winner will receive The “Aloha Hawaii!” Grand Prize consisting of: 140,000 Hawaiian Airlines® HawaiianMiles®, two (2) Dole® branded beach towels, two (2) Dole® branded Frisbee® discs, two (2) Kingsford® branded Koozie® beverage holders, two (2) Nathan’s Famous® branded baseball hats, two (2) KC Masterpiece® branded t-shirts, and two (2) KC Masterpiece® branded sunglasses. The ARV of The “Aloha Hawaii!” Grand Prize is $1,549.98. 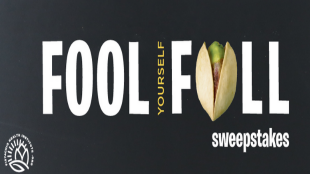 Pistachio Health Institute “Fool Yourself Full ™ Sweepstakes” – Win a year supply of pistachios! Win a year supply of pistachios and a pistachio snacking bowl set! 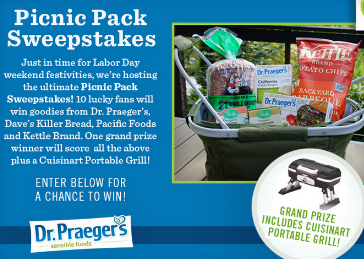 ENTER SWEEPSTAKES HERE – Pistachio Health Institute Facebook page. ENTRY LIMIT – Limit one (1) entry per individual, per day. ELIGIBILITY – The Promotion is open only to legal residents of the continental United States who are 18 years or older or the age of majority in their state of residence, whichever is older at time of entry. SWEEPSTAKES PERIOD – The Promotion will start at 1:00 p.m. (Pacific Daylight Time [“PDT”]) on Monday, March 30, 2015 and end at 11:00 p.m. PDT on Thursday, April 30, 2015. PRIZES – One (1) prize will be award for the Promotion. The winner will be selected to receive a one year supply of pistachios (two (2) cases of 25 8 oz. bags of roasted and salted pistachios) (approximate retail value (“ARV”): $349.50) and one set of pistachio snacking bowl (ARV: $17.00). Total ARV of the prize: $366.50. 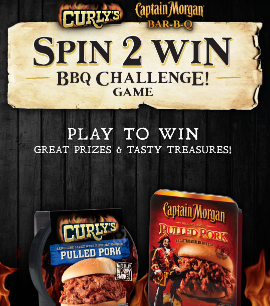 Curly’s BBQ Challenge Instant Win Sweepstakes – Win Curly’s BBQ products! Win a box of Curly’s products worth $78 (75 winners)! ENTER SWEEPSTAKES HERE – Curly’s BBQ Sweepstakes page. ELIGIBILITY – Curly’s BBQ Challenge (the “Instant Win Game”) is open only to legal residents of the fifty (50) United States and the District of Columbia who are at least eighteen (18) years old at the time of entry. SWEEPSTAKES PERIOD – The Instant Win Game begins on January 26, 2015 at 12:00 a.m. Eastern Time (“ET”) and ends on March 24, 2015 at 11:59 p.m. ET. PRIZES – SEVENTY FIVE (75) GRAND PRIZES: A box of Curly’s products (products determined by Sponsor in its sole discretion). Approximate Retail Value (“ARV”): $78. THREE HUNDRED (300) FIRST PRIZES: A Curly’s hat. ARV: $20. FIVE HUNDRED (500) SECOND PRIZES: A coupon for one (1) Curlys FREE PRODUCT. ARV: $8.99. FIVE HUNDRED (500) THIRD PRIZES: A coupon for a Captain Morgan Barbeque Sauce FREE PRODUCT. ARV: $8.99. TWENTY THOUSAND (20,000) FOURTH PRIZES: A coupon for $1.00 off any Curly’s product. ARV: $0. 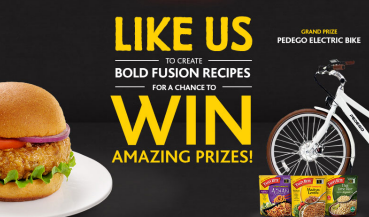 The “Tasty Bite Fusion” Sweepstakes – Win a Pedego Electric Bike! ENTER SWEEPSTAKES HERE – Tasty Bite Facebook page. ENTRY LIMIT – LIMIT OF ONE SWEEPSTAKES ENTRY PER HOUSEHOLD, PER DAY, PER SWEEPSTAKES PERIOD REGARDLESS OF THE METHOD OF ENTRY. ELIGIBILITY – Open only to legal residents of the 48 contiguous United States (excludes Alaska, Hawaii and all United States territories and possessions), who are eighteen (18) years of age or older as of April 9, 2014. SWEEPSTAKES PERIOD – The “Tasty Bite Fusion” begins at 12:01 AM Pacific Daylight Time (“PT”) April 9, 2014 and ends at 11:59 PM PDT June 30, 2014. Fisher Nut Exactly Sweepstakes & Bonus Sweepstakes – Win a $100 Visa gift card! Five winners will each receive a package of Fisher Nut Exactly Snack Bites! One winner from the Bonus Sweepstakes (you’re entered when a friend enters using your referral link) will win a $100 Visa gift card! ENTER SWEEPSTAKES HERE – Fisher Nuts Facebook page. ENTRY LIMIT – Limit one entry a day per person and per email address into the NEW Fisher® Nut Exactly Sweepstakes. For each person who follows the unique link provided by you and who enters the NEW Fisher® Nut Exactly Sweepstakes, you will receive an entry into the Fisher® Nut Exactly BONUS Sweepstakes. ELIGIBILITY – To be eligible, you must be a legal resident of one of the 50 United States or District of Columbia and must be 18 years of age or older at time of entry. SWEEPSTAKES PERIOD – The NEW Fisher Nut Exactly Sweepstakes and Fisher ®Nut Exactly BONUS Sweepstakes begin at 12:00:01 a.m. Central Time (“CT”) on March 26, 2014 and ends on March 30, 2014 at 11:59:59 pm CT.
PRIZES – Five (5) winners from the NEW Fisher® Nut Exactly Sweepstakes will each receive a prize in the form of a package of Fisher® Nut Exactly snack bites . Approximate retail value (“ARV”) of each prize is $6.99. One (1) winner from the Fisher® Nut Exactly BONUS Sweepstakes will receive a prize in the form of a $100 Visa gift card (ARV $100).